Ferguson’s art programs have a variety of talented students, including the students in the choir program. Many may have the impression that singing in a choir could not possibly be too challenging, but that’s completely wrong. Properly and professionally singing actually requires skill, technique, and hard work. Choir students work all year long to perfect every song they perform, and it all leads up to the Music Performance Assessment or MPAs. The MPAs are a competition between all the choir groups in a district where students are judged on their ability to read music (also referred to as “sight-reading”) and perform based on certain standards. They are then rated by a set of three judges, and whoever gets an overall “superior” rating moves on to States. Two of Ferguson’s choir groups, the Falcon Singers and the Lady Falcons, have been going for years. This year, their judgment day was Thursday, March 14th. The choir students spent months preparing for the day, and when it came it filled the choir room with both excitement and anxiety. 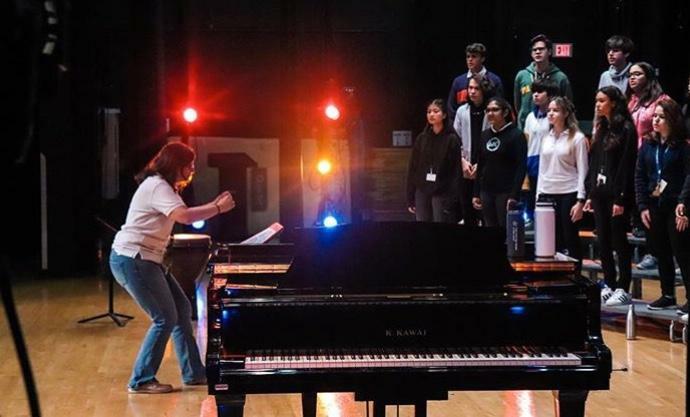 The prior year, only the Falcon Singers had moved on to the state-level competition, while the Lady Falcons had barely missed their mark. This year, though, both groups came back triumphant, both bringing home overall Superiors. The choir groups had to perform songs in front of an audience and judges. The Lady Falcons performed two pieces that earned them straight Superiors, including Voice on the Wind and Invitation to Love. The Falcon Singers performed two songs: Salmo 150 and Salvation Is Created. Both of the Lady Falcon’s performances and the Falcon Singer’s performance of Salvation Is Created is available to listen to on their YouTube channel. While the choirs were relieved and thrilled to learn that they passed to States, there is no denying that they also feel very nervous about how challenging it will actually be. “It’s going to be a lot more intense, and there’s going to be a lot more pressure on us.” Senior and Lady Falcon Vasti Gonzalez said. The Lady Falcons and Falcon Singers are set to compete with schools across the state on April 18th. Although they are nervous, the choir singers are determined to do great things and are confident that they will do well in States this time around. “I’m so proud of how far my choir has come and I’m ready to see how much more we can achieve,” Brenden stated.